Following another cluster of a debate, billionaire business mogul, reality television star, awful wig enthusiast, and sudden voice of middle America, Donald Trump is sitting pretty heading into next week's Super Tuesday collection of primary elections. Sure, every pundit says Florida Senator Marco Rubio won last night's debate, after he and Texas Senator Ted Cruz came out on the offensive, finally pointing out that Trump has no actual health care policy other than "allow competition over state lines," and no foreign policy other than "be tough and make deals." But guess what guys? We already knew that, and he's still killing you both in national polls! RealClearPolitics, an organization that weighs and averages most national polls to give a "true" poll, has Trump holding 33.2 percent of Republican voters nationally, well ahead of Cruz (20.3), Rubio (16.7), Ohio Governor John Kasich (9.3) and surgeon/guy who just woke up from a nap Ben Carson (7.5). Making matters even more hopeless for this clueless Republican field is that, heading into Super Tuesday, polls show Trump leading in nine of the 12 states holding primaries that day. Only Cruz' home state of Texas, Arkansas (though Cruz' lead is a measly four points there) and Colorado (where Ben Carson is leading, because he looks like a guy about to make a 2 am Taco Bell run) stand in Trump's way of a complete sweep. While Trump has under-performed his polling a bit (see Iowa), it's hard to believe he won't capture at least half the states on Super Tuesday, especially when he's leading by 27.5 points in Massachusetts, 21 points in Alabama, 15.7 points in Georgia, 15 points in Vermont and 10 points in Virginia. Those leads all seem pretty insurmountable at this point. So, how the hell did we get here? How did a man totally devoid of policy ideas, with ever-changing opinions on social issues, who has lied repeatedly, and spewed hate and vitriol become an inevitability for one of America's two major political parties? I'm glad you asked. It's all your fault America, but more specifically, it's these people's fault. Oh sure, they want Trump gone now, and of course now they're saying his calls to ban Muslims from entering the country and increasing popularity among white supremacists are troubling, but the GOP has long since motivated its base with fear and hate, they've just done it with more subtlety. After years of railing against women's health, gay rights, and failing to even acknowledge the plight of minorities and immigrants, it's not much a shock to see the Republican base devolve into a swarm of angry white guys that believe gay wedding cakes, Planned Parenthood and immigrants are the reason they're not millionaires. Does that make any sense? No, but that's not the point. And let's not forget about the recent Tea Party/Birther movements. The Tea Party basically laughed at the idea of political experience as a necessity for holding nationally relevant political offices. This is how Sarah Palin and Michele Bachman became household names, but Trump is by far the scariest Tea Party creation, though not a direct one. Trump laughs off political experience, and actually paints "knowing what you're doing" as a weakness. Surely if you know how politics work, you can't possibly fix this mess, because it was politicians who got us here in the first place! Also, as one of the original "Birthers," Trump used his stature as a symbol of American wealth to legitimize absurd claims about a current President. To many of Trump's supporters, it doesn't matter if he has no real plans or experience, at least he isn't a Muslim terrorist born in Kenya! You can say Trump has "hijacked" this once proud party, but all he's really done is taken it where it was going anyway. This was quickly becoming an angry party of under-employed white guys, the Donald has just decided to pander to them more openly. For years, mega-popular radio hosts like Rush Limbaugh, Sean Hannity and Glenn Beck have spewed hatred of "the other," belittled the poor for not working hard enough and exaggerated the problem of illegal immigration. They basically told all unsuccessful white men that their problems weren't caused by a lack of education, or the failure of their country to retain unskilled jobs in an ever-changing global economy. No, the problem was actually Mexicans, Muslims, black kids getting affirmative action, and the Antichrist President trying to steal their guns. Can we really be surprised when these same people, whirled into an eight-year frenzy where a (gasp) black man/probable Muslim terrorist was President of the United States, use those exact same fears and prejudices to select their next leader? When Trump says he'll build a wall and make Mexico pay for it, of course it has no grounding in reality, but his supporters aren't voting for a president, they're voting for a tough-sounding talk radio host. Disagree with him? That hypothetical wall just got 10 feet taller! How is he going to get Mexico to pay for this wall? Because they're ripping us off in trade! Uh, so is he going to let Mexico continue to rip us off in trade in exchange for the wall, or is he going to correct our trade deficit with Mexico? But wait, if he does that, what leverage will he have to make Mexico pay for the wall… Don't worry about it, he's gonna make a deal! Well, I guess we shouldn't blame you guys, because you're all pretty pumped about the Donald heading to The White House. Shockingly, around 20 percent of Trump supporters think that Abraham Lincoln should NOT have freed Confederate slaves, while 33 percent of his fans also thought that putting Japanese-Americans in internment camps during World War II was a good idea. Furthermore, nearly 2/5ths of Trump voters "wish the South had won the Civil War." So yeah, this is what most of them are talking about when they say "Make America Great Again." Apparently, American hasn't been truly great since The War of Northern Aggression in 1861. But it doesn't just end with racial intolerance. Trump fans largely support his call to ban Muslims from entering the United States and, though Trump has barely said anything about gay rights, 1/3rd of his supporters want to bar gays and lesbians from entering the country. He may not have brought up a "gay ban," but it's undeniable that this is the kind of voter he's attracting. Sure, we can blame the field for staying too crowded, too long, and allowing Trump to win state after state without facing a singular rival, but that would be ignoring the fact that nearly every candidate in the GOP primary field is incredibly flawed. Ted Cruz: If anybody is more hateable than Trump in this field, it's this guy. Seriously, try to find somebody, outside of an endorsement speech, saying a nice thing about Ted Cruz personally. It doesn't exist. Marco Rubio: Rubio waited far too long to go on the offensive, and then smiled like a 7-year old who just said a naughty word every time he landed a zinger last night. What's worse, he basically went down to Donald Trump's "you're a doo-doo face loser" level, and only Trump can pull that off. Rubio, like any sane person in that position, looked childish. But furthermore, Rubio has too little experience (and no executive experience) to really be authoritative on anything, but he has too much experience to be an "outsider" like Trump or Carson. That combination worked in 2008 for Obama, who rallied a young base that was open to change on the Democratic side, but it isn't likely to work in the party of angry middle-aged white dudes who fear change (and Hispanics). Sorry, but you're caught in experiential/ethnic limbo for this election, Marco. Ben Carson: Oh come on. John Kasich: The Ohio Governor is a nice guy with tons of political experience, both in Congress, and as the Governor of one of America's largest states. In any other year, a genuinely good person who has pushed bi-partisan legislation and balanced the budget while in the House, and grown a struggling Midwestern economy, while staying above the fray of personal attacks would be slam dunk… Not this year, John. The people don't want results, they want blood, and you're not giving it to them. Jeb! : I can't even... How did Jeb make me feel bad for a Bush? Chris Christie: He's a Northeast loud mouth like Trump, but one with a political record that can be attacked, and BOY can his record ever be attacked. I could go on and on about Carly Fiorina's lies and failings in business (it only works when the Donald does it, woman! ), Rand Paul making too much sense on US interventionism and nobody else having enough star power, but you get the point. This was a weak field, and Trump has played everyone in it like fiddles. 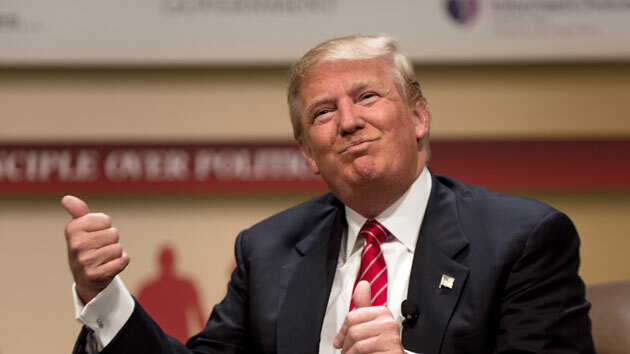 For months, pundits at all major news organizations have told us the Donald has no chance. His 59 percent unfavorable rating, along with intolerant attitudes, we were told, would sink him once the campaign really got going. Well, I hate to break it to you guys, but you grossly overestimated the American electorate. Largely, Americans don't care that he has no specific plans for implementing any of the changes he's proposing, they just think he's "strong" and "tough," and that's good enough for them. In fact, by proclaiming that he can't win, you've given him a rallying cry and beef with the media, and we know how conservative voters HATE the media for telling them things they don't want to hear. By giving Trump underdog appeal, and an even greater claim that the establishment doesn't want him, the media has made Trump even more popular. True, Hillary Clinton does hold a 2.5-point lead over Trump in a hypothetical election poll, while Bernie Sanders leads the Donald by 6 points, but if there's one thing Trump has done well, it's insult his way to higher poll numbers. Lost in a flurry of "Benghazi," "Monica Lewinsky" and "socialist" insults, the issues will quickly become secondary to Trump's cult of personality. Neither candidate will back down but, ultimately, Hilldog's own unfavorable ratings will make it hard for her to beat Trump in a popularity contest, while the word "socialist" could doom Bernie Sanders, as Trump paints his new election as a modern-day Cold War. Neither of these tactics are in any way relevant to the issues at hand, but after seeing the way voters have reacted to Trump thus far, I'm terrified that they will work. But really, American voters, this is mostly your fault. The fact that you've been so willing to accept the fact that, all of sudden, Trump is totally a devout Christian. You know, because now it makes political sense for him to be one. Or that he's changed his mind about abortion, gay marriage and the Iraq war. Or that he ran a fake "real estate school" to rip off middle class Americans, or that he tried to use eminent domain to take an elderly woman's home and use it as a parking garage for limos. And hey, let's just forget about the fact that this great protector of American trade interests has produced millions of items of clothing in China, and that this enemy of illegal immigration used undocumented Polish immigrants to build Trump Tower, and tried to cheat them out of the meager wages he owed them. Seriously, the information is out there. We live in the age of the internet, where you can be as informed, or ignorant, as you choose to be. Now, Trump will counter all of this by saying "I was a businessman at the time, of course I did what was best for my business." That may be the case, but are we really that dumb? Do we really believe that the kind of businessman Trump was will have NO effect on the kind of President he will be? Do we really believe that a man who has repeatedly crushed the little guy with his big money is now running to fight for us, and not his own ego? That doesn't sound like the Donald Trump I watched on "The Apprentice," or the one I saw fight Vince McMahon in WWE. If we're judging all other candidates' character based off their political record, it's only fair that we judge the Donald's character on his business record. After all, he's running on the fact that he's a successful businessman, so shouldn't the bad parts of his business past count too? If the American people are really dumb enough to not see all the contradictions and unethical behavior, I guess we deserve a Trump Presidency. Lacrosse? But I'm in satirical political mode... Just kidding, you know I've got CMass lax previews comin' soon. How soon? That depends on how much work I get from ESPN and Worcester Magazine the next week or so, but definitely be on the lookout for them.